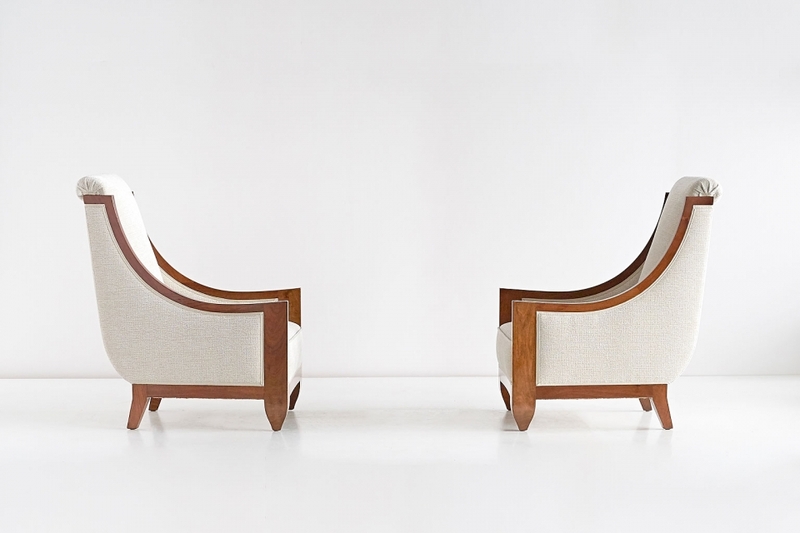 This rare pair of armchairs was designed by André Sornay and produced in his own workshop in Lyon, France in the late 1920s. 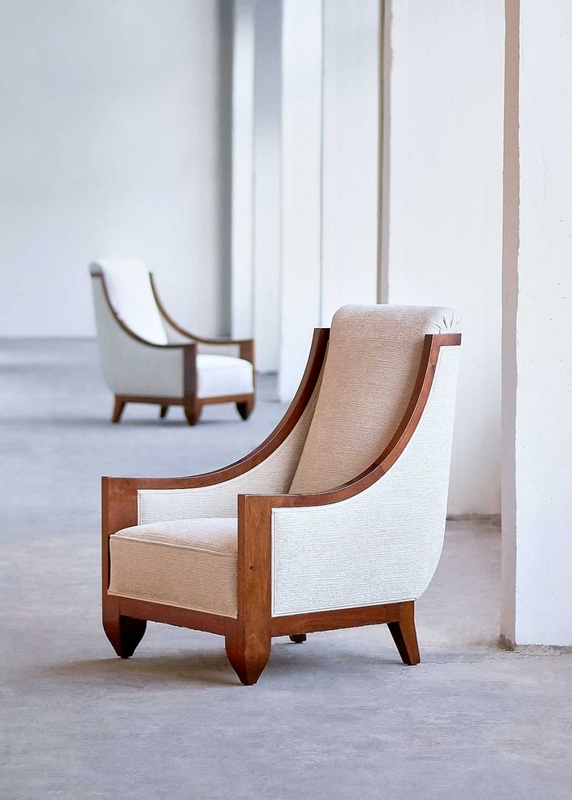 The solid walnut frame with its curved armrests and striking frontal legs perfectly illustrates the craftsmanship and elegance of Sornay’s work. The woodwork has been refinished and the chairs have been fully reconditioned with new springs and reupholstered in a sand colored Vello d’Oro fabric. This Rubelli Venezia fabric is a soft chenille with gold metallic yarns subtly woven into the velvet-like fabric. Both chairs are signed with “A. Sornay” next to the right frontal leg. Provenance: Private Collection, Lyon, France. The chairs belonged to a Lyonnaise artisan who had his atelier next to Sornay’s. By descent, the chairs remained in the same family since then. Literature: T. Roche’s André Sornay, Beau Fixe Edition, 2002, model pictured on page 112. 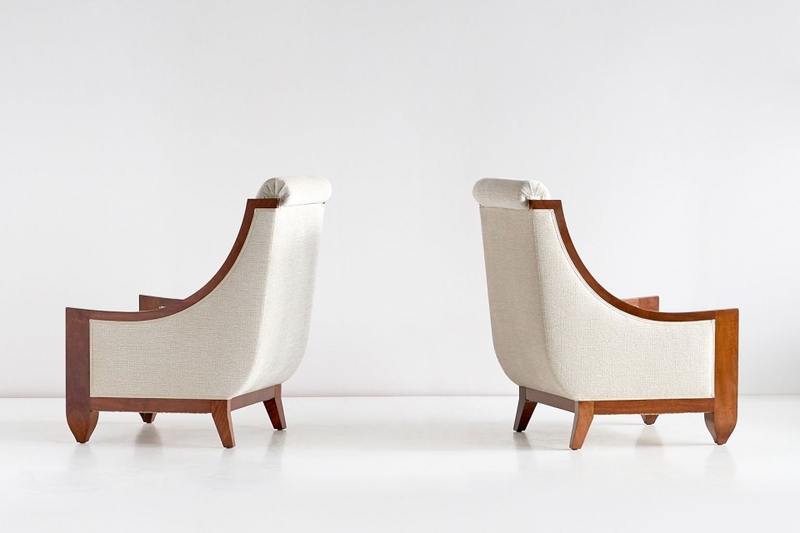 Condition: excellent, the pair is fully restored. The woodwork has been refinished. The chairs have been fully reconditioned and newly upholstered in a sand colored Rubelli Venezia fabric.